Pristine hardback edition, with JYS' Tyrrell on the flyleaf cover; purchased new and stored with care. I'm a Christian missionary in Asia, and have left the book at a local Church office in the UK, from where it can be collected or posted to you. All the sale price will go to a Christian ministry in Asia (not mine) caring for destitute widows and street children. PayPal to me, or cash to the Church, whichever is convenient. Edited by TRUNNION, 05 December 2014 - 01:12. Christmas gift for a mellowing petrol-head? If, back at the church office in the UK, there is someone who can list it for you, including a photo and the condition details that any potential buyer would expect, you should have more luck. Whereabouts is your UK church? Thank you John, kind of you to advise. The church is oop North, and I don't wish to trouble the volunteer Staff with the hassle of listing it on eBay, or posting it. They've already been kind enough to store it safely for me. And, come to think of it, I doubt such a large book would be safe in the post. It's in perfect condition, so it'd be tragic if it got dinged in transit. It's within cycling distance of Oulton Park so I'm hopeful a local TNF Honourable Petrol-head can collect it. Let's bless those widows and orphans in Asia! All proceeds go to the missionary helping widows and orphans in Nepal. Great !! God Bless You. Perfect Christmas gift for a Scotsman or nostalgic petrol-head. Trunnion. Now that you seem willing to post the annual, why don't you list it on Ebay where someone might buy it? As you may have gathered, not many people visit this forum, let alone buy anything. Thank you John, but no change in our position on eBay, see my post 6 above. It's in easy range of lot's of motor-racing hotspots, such as "Chumley", Oulton Park, and such like This thread will succeed in its purpose, of that I'm certain. Reminder bump: Increasing in value daily, and it could be yours. All your funds will go to bless widows and orphans in Asia. Still available to a kind-hearted person, and still rising in value as Sir JYS enters his final laps. A sound investment in the most important way possible. Copies on eBay are still selling for over £100. Thank you for your kind suggestion John, but we don't touch eBay. Initially, I was thinking of posting the tome, but reconsidered when I realised I'd be putting friends to more trouble, as well as jeopardizing its pristine corners. We still have great confidence in the deep benevolence of the members of these noble fora. 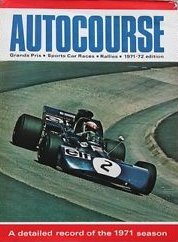 Grab it now ready for JYS to sign it for you at Goodwood, where he celebrates his 80th birthday and first WDC.